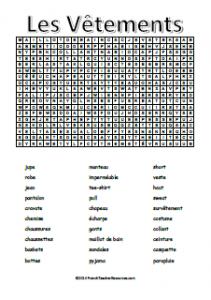 A wordsearch of common French clothes words. This worksheet has two differentiated versions. 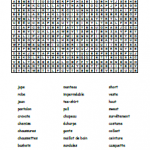 The words in the wordsearch are of course all in French, but you can choose from the listed vocabulary being in French or in English. To download the simple French version, click on the picture below. To download the higher level version, where students are given the English vocabulary and must work out the French, click here. To download an answer sheet with the solution highlighted in red, click here.